Wow! That's just Great. So, is it Finished or are You adding more Hipster Goodness to it? p.s. Thanks for the tutorial blog. I'm looking forward to trying it out on some of My character ideas. Wow. This is an amazing sculpt. I don't think I am quite done with this piece. I will probably keep it around and just add more and more hipsterness to it when I have some time. I got kind of bogged down, and hope to return to the tutorial soon. Thanks for looking everyone! That looks great, Irene! Did Josh pose for you, I've seen him standing that way for years! 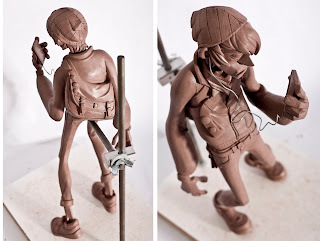 Your sculpts come out so clean. This is really dope!